Christopher Wray said the risk of a drone attack is "steadily increasing" due to their widespread availability and ease of use. The FBI is convinced that terror groups will use drones to carry out attacks on American soil, director Christopher Wray said Wednesday. 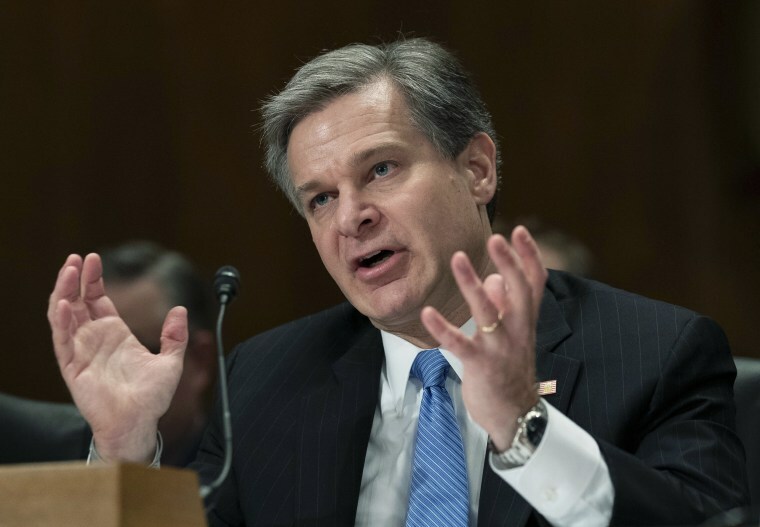 Wray told a Senate committee hearing the threat of drones and other unmanned aircrafts is "steadily escalating" due to their widespread availability and ease of use. "The FBI assesses that, given their retail availability, lack of verified identification requirement to procure, general ease of use, and prior use overseas, UAS will be used to facilitate an attack in the United States against a vulnerable target, such as a mass gathering," Wray said in written testimony to the Senate Homeland Security and Governmental Affairs Committee, using an acronym for unmanned aircraft systems. Wray noted that the U.S. has yet to face a drone attack by terrorists. But he said the widespread use of the devices in overseas conflict areas suggests that it's only a matter of time before a terror organization or drug cartel employs them in an attack inside the U.S.
"Terrorist groups could easily export their battlefield experiences to use weaponized (unmanned aircraft systems) outside the conflict zone," Wray said. "We have seen repeated and dedicated efforts to use UAS as weapons, not only by terrorist organizations, such as ISIS and al Qaeda, but also by transnational criminal organizations such as MS-13 and Mexican drug cartels, which may encourage use of this technique in the U.S. to conduct attacks." The risk has only increased in the wake of the alleged assassination attempt of Venezuelan President Nicolas Maduro using explosive-laden drones, Wray said. Maduro was unharmed when the drones detonated overhead while he was delivering a speech to hundreds of soldiers in August. Seven Venezuelan National Guard soldiers were injured in the attack in Caracas, authorities said.